Gorgeous colors!! Love the water reflection as well. Beautiful. The story behind "Memorial fountains at Poklonnaya Gora, Moscow"
Moscow (and Russia in general) is filled with war memorials, this is one of the bigger ones in Moscow: Poklonnaya Gora (Hill). 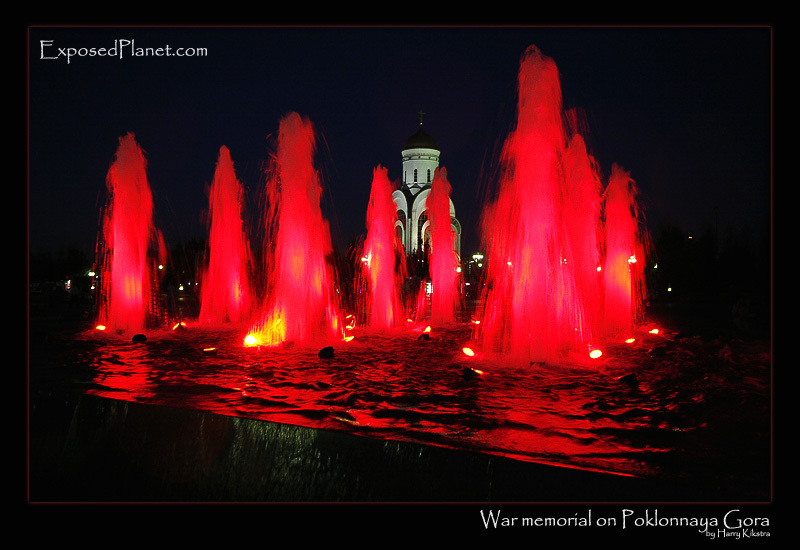 The red fountains symbolize the unthinkable amount of blood that had been shed during the Russian participation in the second World War, or as the Russians call it: the Great Patriotic War. The fountains are part of a larger park, where a giant obelisk with Nike, the goddess of Victory is flanked by a nice park, where old Russian tanks are parked. In the back you can see part of the Church of St George the Victorious, nearby are also a synagogue and a mosque. It was long kept a secret how many Soviet lives were lost between 1941 and 1945, but generally it is accepted that between 20 and 25 million people died, accounting for nearly half of all fatalities caused by WWII.